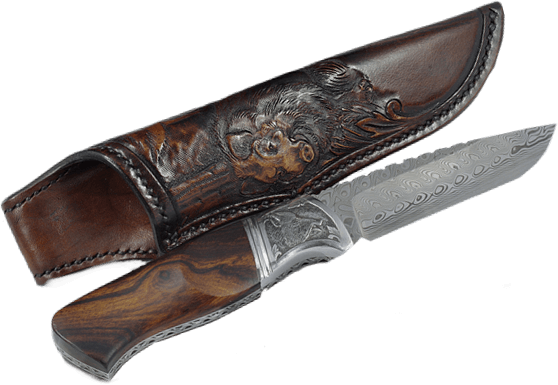 The knife is a common tool but also a collectable value. Sometimes we get it by ourselves, sometimes somebody gives it to us like a present. It can be a pocket knife or a belt knife. Most importantly, it must be sharp and must be handy. A real joy is when our knife is not a dozen, but it’s a unique piece. Each knife, of course, needs its care – cleanse, scrape and gently oily. I like knives and I try to make them to make you impression. If you are interested in my work, I will be happy if you become the owner of one of the knives from my workshop. Each knife is made up of several parts. For the final effect I use only high quality and noble materials. I obtain this material from domestic or foreign sources. I regularly take part in presentations and exhibitions not only in Slovakia but also abroad. You can also find invitations for actions to take place in the future. Look into the spaces where original blades are created. You can look directly at my workshop. The gallery also contains photographs of the knives that were created in the workshop.